I also read somewhere a while ago that it is thought up to 50 migrant women a day are in trouble. Everyday I see Filipina, Sri Lankan and Ethiopian women on the streets, running errands for the households they work in, walking dogs, carrying heavy shopping, doing all the things that Lebanese men and women think are beneath them. These women cook, clean, take care of children (they essentially become surrogate parents in fact as it seems they spend more time with the children than their mother’s and fathers), and receive almost nothing in return. Recently alot of stories have appeared in the media about employee’s treatment of workers. Some of those stories are incredibly shocking- one migrant woman in Saudi Arabia was repeatedly beaten with a rusty metal pole and chained outside for days in the boiling heat- when she was rescued her hands and feet were in such gangrenous condition they needed amputating. That’s just one case: what about the others that occur everyday behind closed doors? We know very little about what goes on in the houses these women live and work in. It makes me sick and ashamed to think my middle-class Arab brethen from Saudi Arabia to Egypt, Jordan to Oman feel it is their right to lord over others and effectively treat migrants like slaves. It’s time the Arab world addressed this issue seriously. The Lebanese whine on about how they are mis-represented and discriminated against abroad, but they are doing nothing to protect the foreign women who work hard to run their households. 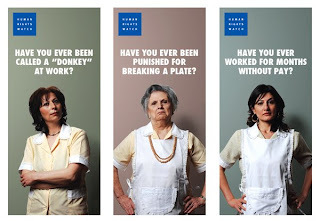 So, cheers to HRW for bringing some light to the issue on the occasion of Labor day (May 1). Although they are only addressing basic human rights violations and ignoring sexual abuse and violence, I hope this is will pave the way for more awareness on the issue.Click here for HRW testimonies collected from migrant workers, here to go to Migrant Rights .